More than 40% of pancreatic ductal adenocarcinoma (PDAC) patients have glucose intolerance or diabetes. The association has led to two hypotheses: PDAC causes diabetes or diabetes shares risk factors for the development of PDAC. 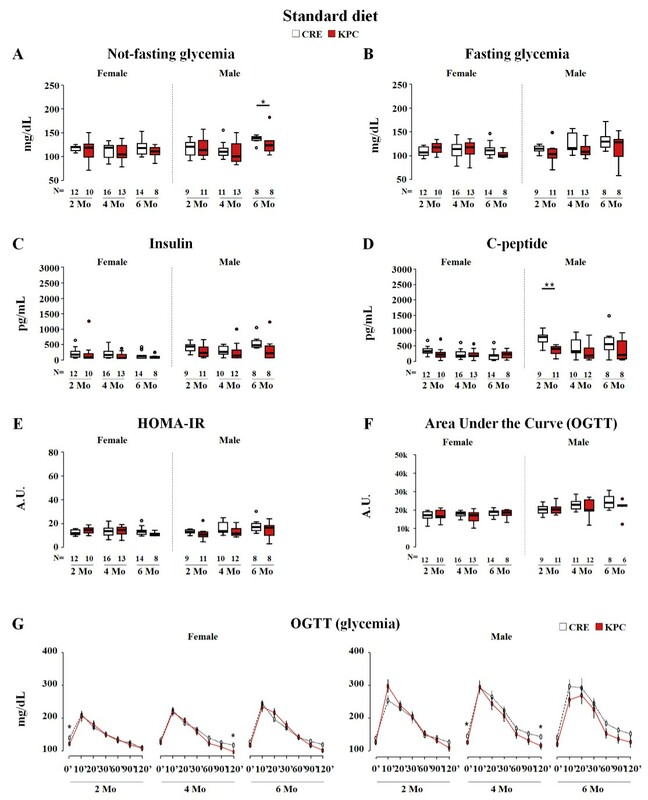 In order to elucidate the relationship between diabetes and PDAC, we investigated the glucose metabolism during tumorigenesis in the LSL-KrasG12D/+; LSL-Trp53R172H/+; and Pdx-1-Cre (KPC) mouse, a genetically engineered model of PDAC. Male and female KPCs have been fed with standard diet (SD) or high-fat diet (HFD). The imaging-based 4-class tumor staging was used to follow pancreatic cancer development. 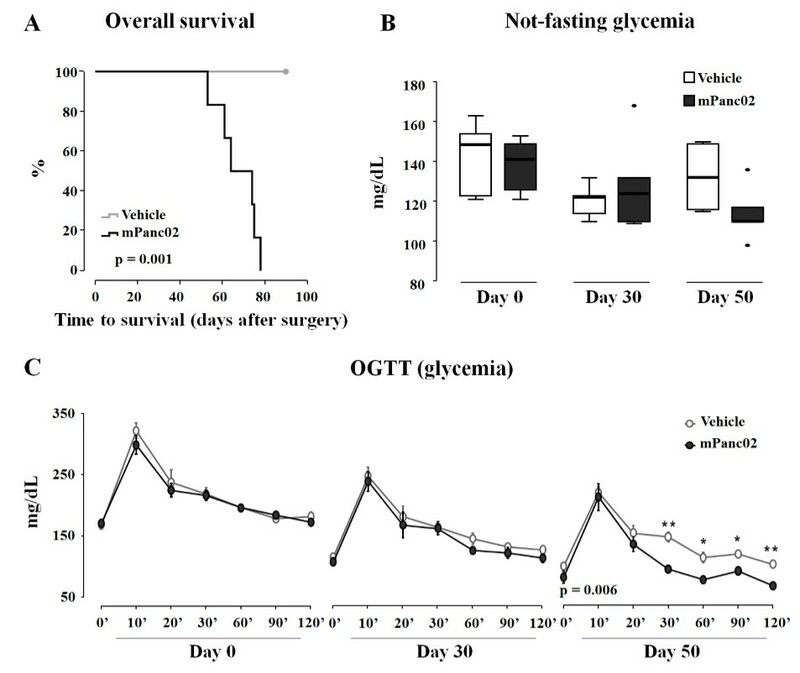 Not fasting glycemia, 4-h fasting glycemia, insulin, C-peptide, glucose tolerance after OGTT and abdominal fat volume were measured during tumorigenesis. 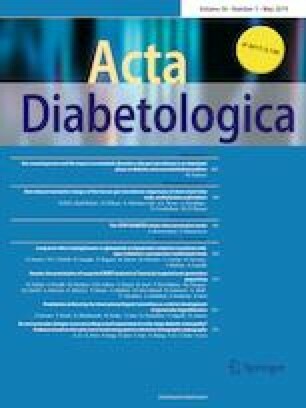 PDAC development did not lead to an overt diabetic phenotype or to any alterations in glucose tolerance in KPC fed with SD. 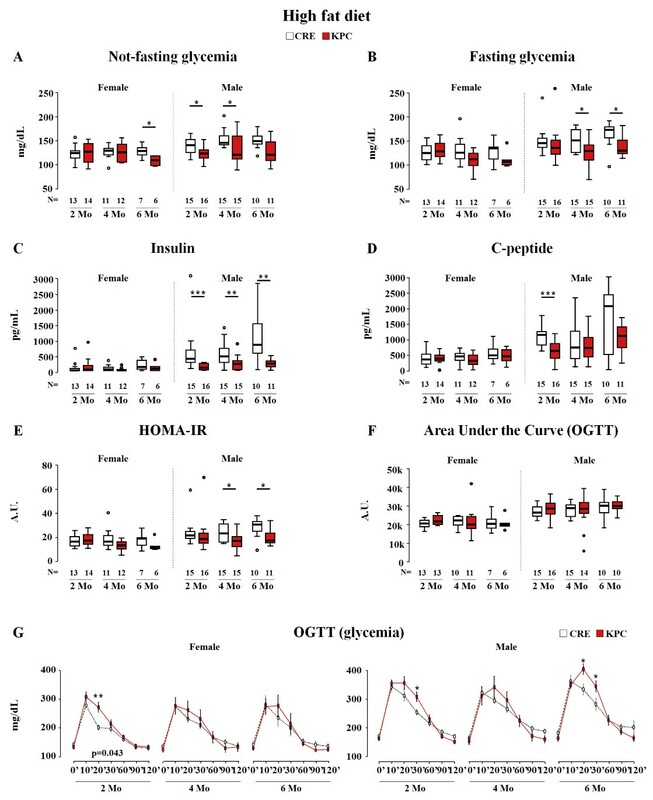 Consumption of HFD induced higher body weight/abdominal fat volume and worsened glucose homeostasis both in control CRE mice and only in early tumorigenesis stages of the KPC mice, excluding that the cancer development itself acts as a trigger for the onset of dysmetabolic features. Our data demonstrate that carcinogenesis in KPC mice is not associated with paraneoplastic diabetes. The online version of this article ( https://doi.org/10.1007/s00592-019-01335-4) contains supplementary material, which is available to authorized users. Valentina Pasquale and Erica Dugnani equally contributed to this manuscript. This study was supported by the Associazione Italiana per la Ricerca sul Cancro (AIRC, bando 5 X 1,000 N_12182). VP, ED and LP contributed to study concept and design; VP, ED, DL, PM, AC, TC, MP and LV helped in acquisition of data; VP, ED, PM, AE and LP contributed to analysis and interpretation of data; VP, ED and LP contributed to statistical analysis of data; VP, ED, DL and LP helped in drafting of the manuscript; and AE, LP contributed to critical revision of the manuscript. All authors have approved the submitted manuscript. This study was approved by the Animal Care and Use Committee of San Raffaele Scientific Institute (IACUC number 559) and performed in accordance with their guidelines. For this type of study informed consent is not required.